The diversity of Pakistan is undeniable, be in its culture, natural habitats, languages or weather. Pakistan is home to many religious beliefs, the major classifications are Islam, Hinduism, Christianity, and Sikhism. Islam leads by being in majority and others follow by being the minorities, spread all over the country. Unfortunately, even though the four major religions exist in the country, the inter-religion dialogue in the community is almost non-existent. 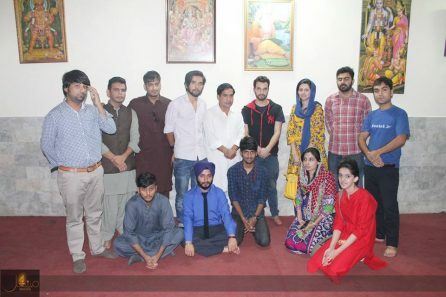 To help in this, Mashal, an upcoming Lahore-based NGO, working towards diminishing barriers within the society, in its effort to bring about a small change held an intervention in Lahore. Students and scholars belonging to the major religious beliefs were in attendance, they had an open and heartfelt dialogue. The event started with the remembrance of God(s), with recitations of the Holy Quran, Verses from the Bible, Gayatri Mantar from the Rig Veda and Moll Mantar from the Sri Guru Granth Sahib. The aim was to break the ice, by giving everyone present a glimpse into the everyday life of people belonging to these faiths. 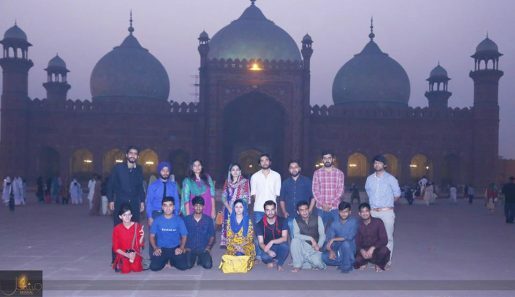 The event was moderated by Laraib Abid – Founder of Mashal, who was praised for her initiative, “ This might be the first time that a Muslim girl in Lahore is striving to raise a voice for interfaith harmony,’’ said the attendings. The panellists talked about the problems the minorities face in Pakistan, be it the hate content in books, lack of opportunities in professional fields or the deficit in communication and interaction between fellow countrymen. The talk focused on the state of affairs in the Punjab region; the past, present and future were waived together. 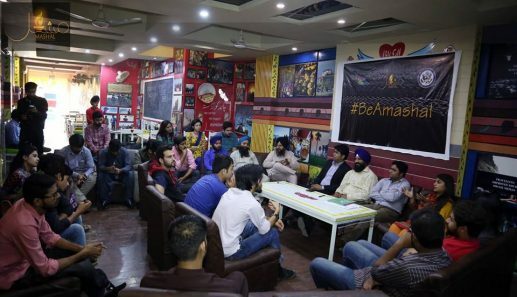 Everyone got to discuss their issues and solution were sorted out – the best being each of the attendees could become the first #Mashal in this pursuit. Pakistan is the Mekkah for Sikh as it houses Nankana Sahib, formerly known as ‘Rai-Bhoi-Di-Talwandi’, where Guru Nanik was born, situated in our very own Punjab. Sikhs from all over the world visit Pakistan every year to attend and celebrate, Gurpurab festivities, commemorating Guru Nanak’s birth. For the Sikh community Pakistan is like Saudia is for Muslims, “this country, our Pakistan is also our sacred land, home to our Nankana Sahib,” said a Sikh attending. “Interfaith and Harmony talk is important for minorities because we suffer from discrimination. The government should give preference to these issues. When Pakistan got freedom in 1947, Muslims were also a minority in many areas of the subcontinent. They definitely suffered a lot, but now Muslims are affecting the minorities in the same manner,” said Kalyan Singh the Sikh Social representative during the discussion, “’Diwali’ has the same meaning as ‘Mashal’, that is how close we are to getting things right”. “Every Religion has its own flavour and values; no religion around the globe teaches its followers to hate. When one religion is in majority, they perceive themselves superior without hesitation. Knowledge should be welcomed whatever the source is. Any book with a humanitarian approach belonging to Islam, Hinduism, Sikhism, Christianity or any other religion, should be read by everyone,’’ said Tahira Urooj, Muslim Social Activist. An important question risen during the talk was the discrimination in schools, a Hafiz e Quran is entitled to extra marks in school but if a non-Muslims learns by heart their holy book, they aren’t considered for the same. Showing that even though the government and school claim diversity, they do not believe in it so. ‘’Conflict isn’t the real issue, it can emerge even in a family but one cannot kill his own blood, mother, brother or sister. Pakistan is our homeland, it’s our home, all religions share the same piece of land and have responsibilities towards it. Being a Christian, reading the Islamiyat book doesn’t affect my faith and I urge Muslims also read our literature. It has many moral science aspects and would help us understand each other better. Punjab Text Book syllabus which is implemented in many areas of Punjab has a part of hate speech for other religious groups. The government should work towards positivity in the nation,’’ said Faisal Ilyas, Christian Social Activist. ‘’History is a very important subject but our books do not contain authentic information. History should be studied with an open mind and one should accept the facts even if they aren’t in their favour. Religion doesn’t teach anyone to kill, conflicts are not religion based. Being a citizen of Pakistan, everyone should go by Quaid’s speech, in which he clearly said that ‘State has no right to discriminate on the basis of religion’,” said Aroon Kumar, Hindus Social Activist. The discussions continued, many questions were raised, many answered and most left for further debates. The discussion was followed by a visit to religious dwellings of all. 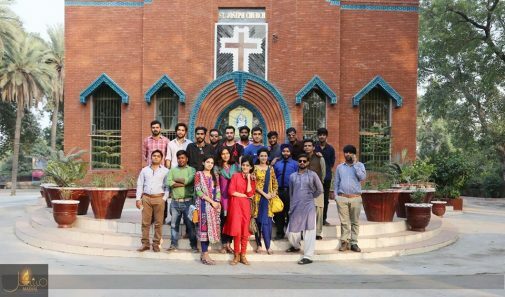 The first stop was the St. Joseph’s Church located in Lahore Cantt, one of the oldest churches from the Roman Catholic Archdiocese in Pakistan. Built on October 31, 1853, it originally served Catholics in the British Army. ”Faith plays a vital role in life because it boats your kind spirit to make virtues for the welfare of mankind. I suggest, especially to the youngsters to keep working towards the up gradation of our core values that may our next generation adequately. May our Lord Jesus cherish us all. Amen!,’‘ said Faisal, a Christian participant during the tour. There was a school beside the church, which currently educates 3,500, in an effort to reduce the estimated 30-40 percent of parish children who receive no schooling. 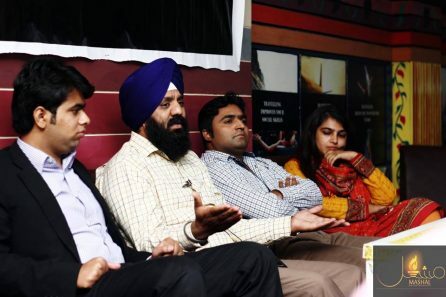 Sikh participants asked questions regarding Christianity and its history. Fr.Qaisar Feroze was kind enough to answer each question with the utmost patience and humility. The participants still had more questions and were welcomed by the Church to come in anytime and calmly do their research. Next, they visited the Mandir; one of the participants thought that there weren’t any temples in the city and was jubilant to be inside one. Kashi Nath, pundit of Krishna Mandir, talked about how prayers are done, occasions are celebrated and the various aspects of the temple and Hindu religion, he also answered the questions raised by the participants. The participants were eager to be part of the next Holi festival and Mr Kashi welcomed them with open arms. Then off they went to, Gurdwara Sri Dera Sahib. 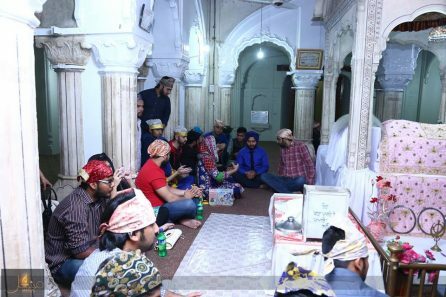 As Gurupurab, was to be held soon, the participants got to interact with Sikhs from different parts of the world. The Gurdwara Dera Sahib, opposite Lahore Fort, is the place where Sat Gur Arjun Dev was martyred in the River Ravi facing the tortures inflicted by Chandu on in 1606 AD. The Sikh community was delighted to host the participants; they recited the Mor Mahal for the participants, answered various questions and appreciated the initiative. Later the Granthi (Sikh representative) showed the participants around the historic Gurudwara. The last stop was at the Badshahi Mosques, as it had gotten late in the evening the Molvi Shahab had left for the day, but the participants visited the area, took the tourist guide’s help, clicked many photos and talked to each other about how religions actually unite us. Many of the random visitors in the mosque were amused upon seeing the Sikh participants and interacted with them. At the end of the day, all the participants discussed the day’s events, what they learned and how it affected them. One of the Muslim participants said, “It’s strange that even though we crossed path every day, we do not know about each other”. They all vowed to take the message forward and do more visits in the future. On an emotional note – participant’s exchanged contact information. “MASHAL has infused a new spirit in me, a spirit that will strive to make this world a better place discouraging the fallacious stereotypes,” said Misbah Uddin, a Muslim participant about the intervention. Mashal continues to work towards a harmonious Pakistan, for which it seeks help from each and every fellow Pakistani – to be part of its movement and #BeAMashal in their own space, helping the nation in its quest for a better country, as much as they can.